← The Comfiest Shoes in the World? 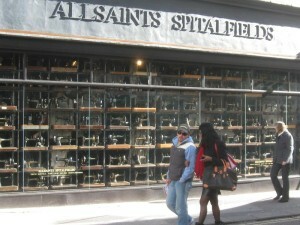 I remember the first time that I clapped eyes on the window of an All Saints store. I was shuffling around Bluewater shopping centre in Kent feeling underwhelmed as usual. Those giant malls just depress me with their rows of outlets that always end up being the same ones wherever you go and then there are those waves of people in the middle of another bout of retail frenzy. Then I saw that signature bank of black sewing machines and stopped in my tracks. I stood and pondered the vista for a moment, wondering why the window was full of old sewing machines but of course the fact that I had stopped to look went a long way to answering that question. Confronted with something different and completely out of context with the otherwise starkly modern surroundings my attention had been comprehensively grabbed. Naturally I went into the store to see what it was all about because I couldn’t tell hovering in front of the window as there were no clothes in it. The interior was a sort of industrial shabby chic, a bit like an abandoned warehouse that had been taken over by some sort of underground movement who were using it for a flea market. I was somewhat shocked when I looked at the prices to discover that a flea market it was not. All Saints’ grungy clothing is actually right up my street but not at those prices. It is hardly cutting edge design or particularly radical just monotone and a little frayed at the edges. The correct term is almost certainly “deliberately distressed”. It is all very grey and anti-establishment in a very mainstream way and decidedly over-priced. So what are the sewing machines all about? Apparently they are the brainchild of a marketing agency, shock horror! Well I didn’t think that someone randomly decided to pack the windows with antique sewing machines. They definitely set the store apart and they are certainly memorable so there’s a couple of ticks in the marketing boxes of success. They fit with the brand’s beat up image so that is another base covered and they suggest old fashioned manufacturing techniques and the heyday of the textile industry which has nothing to do with all Saints at all! I am sure their clothes are turned out in the same Far East and Asian factories as everyone else’s. 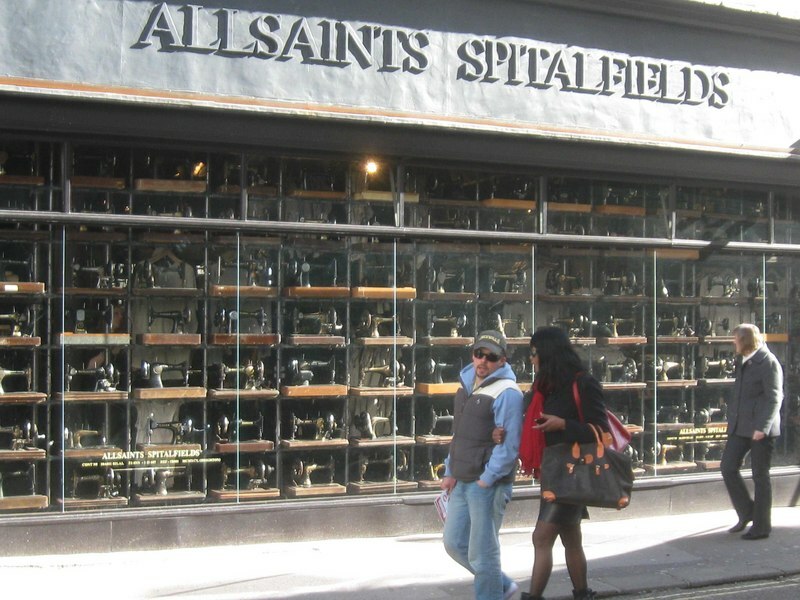 Those factories are clearly not using antique Singer sewing machines because All Saints must have bought up the world’s entire supply judging by how many shops they now have with the things in the window. I am told that they now possess some 40,000 machines in total and that they were sourced in India. I think that All Saints have done with sewing machines what Hollister did with palm trees and blackout zones. Distinctly different stores work in the fashion world even if you use antiques when your market is the younger generation. The human psyche is all rather odd really. The shopping experience is paramount and it sells clothes even if they aren’t up to much and can be bought elsewhere at a much lower price. The only really different thing about All Saints is those windows, the clothes are just grungy back and grey casuals in cheap fabrics thrown together using the latest sewing machines. This entry was posted in Discussion, Fashion and tagged all saints, fashion, sewing machines, shopping, shopping malls. Bookmark the permalink.